The second inauguration of Mr. Jefferson followed an election under which the offices of President and Vice President were to be separately sought, pursuant to the newly adopted 12th Amendment to the Constitution. George Clinton of New York was elected Vice President. Chief Justice John Marshall administered the oath of office in the Senate Chamber at the Capitol. The aboriginal inhabitants of these countries I have regarded with the commiseration their history inspires. Endowed with the faculties and the rights of men, breathing an ardent love of liberty and independence, and occupying a country which left them no desire but to be undisturbed, the stream of overflowing population from other regions directed itself on these shores; without power to divert or habits to contend against it, they have been overwhelmed by the current or driven before it; now reduced within limits too narrow for the hunter’s state, humanity enjoins us to teach them agriculture and the domestic arts; to encourage them to that industry which alone can enable them to maintain their place in existence and to prepare them in time for that state of society which to bodily comforts adds the improvement of the mind and morals. We have therefore liberally furnished them with the implements of husbandry and household use; we have placed among them instructors in the arts of first necessity, and they are covered with the aegis of the law against aggressors from among ourselves. 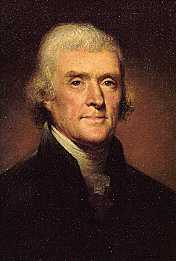 Nor was it uninteresting to the world that an experiment should be fairly and fully made, whether freedom of discussion, unaided by power, is not sufficient for the propagation and protection of truth–whether a government conducting itself in the true spirit of its constitution, with zeal and purity, and doing no act which it would be unwilling the whole world should witness, can be written down by falsehood and defamation. The experiment has been tried; you have witnessed the scene; our fellow-citizens looked on, cool and collected; they saw the latent source from which these outrages proceeded; they gathered around their public functionaries, and when the Constitution called them to the decision by suffrage, they pronounced their verdict, honorable to those who had served them and consolatory to the friend of man who believes that he may be trusted with the control of his own affairs. Contemplating the union of sentiment now manifested so generally as auguring harmony and happiness to our future course, I offer to our country sincere congratulations. With those, too, not yet rallied to the same point the disposition to do so is gaining strength; facts are piercing through the veil drawn over them, and our doubting brethren will at length see that the mass of their fellow-citizens with whom they can not yet resolve to act as to principles and measures, think as they think and desire what they desire; that our wish as well as theirs is that the public efforts may be directed honestly to the public good, that peace be cultivated, civil and religious liberty unassailed, law and order preserved, equality of rights maintained, and that state of property, equal or unequal, which results to every man from his own industry or that of his father’s. When satisfied of these views it is not in human nature that they should not approve and support them. In the meantime let us cherish them with patient affection, let us do them justice, and more than justice, in all competitions of interest; and we need not doubt that truth, reason, and their own interests will at length prevail, will gather them into the fold of their country, and will complete that entire union of opinion which gives to a nation the blessing of harmony and the benefit of all its strength.